Exercise preventative maintenance by placing absorbent doormats at the most frequently used entrances to your home. Change or launder when these mats become soiled. Note about edge finish: Our tufted wool area rugs that are machine-finished with a "serge to blend" overcast stitch, using a yarn that closely matches the yarn of the rug. A narrow fabric binding applied beneath the stitching adds strength and helps to keep yarns in place. One of the most crucial areas of wool maintenance is prompt removal of spots and spills. Acting quickly when anything is spilled or dropped, and always having the necessary cleaning materials on hand are of the utmost importance. Immediately blot (do not rub) spills with white paper towels or clean absorbent cloth. Scoop up solids. Pretest any spot-removal treatment in an inconspicuous area. Work inward from the edge of the spot to prevent excess spreading. Wait a few minutes for the cleaning agent to work on the spot. Rinse with clear water applied to a clean cloth (do not apply water directly to the rug). 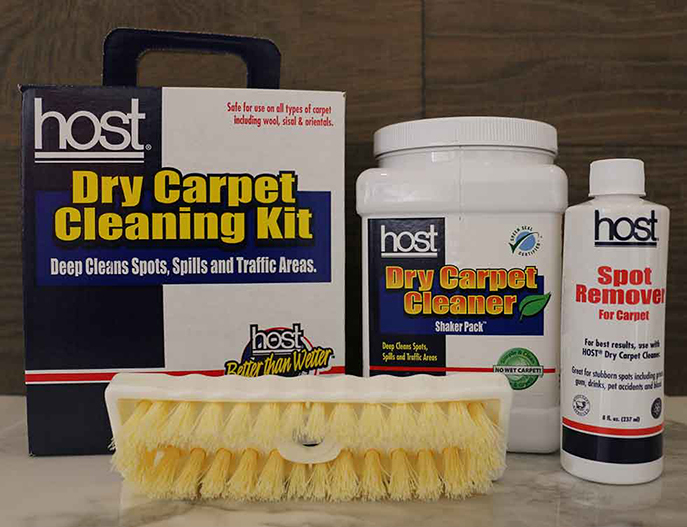 Though nothing can guarantee the complete removal of a stain, a dry carpet cleaning system such as HOST is by far the most successful method for cleaning natural fiber floor coverings. HOST works by using a highly absorbent powder moistened with water, detergent, and a small amount of solvent. The sponging action of the cleaner dissolves and absorbs soil and spots, which can then be removed by vacuuming. One box covers 208 square feet. Please note: HOST Dry Cleaning Kit is only available for ground shipment within the continental U.S.